I love trying new and intriguing products. I really do. The thing is, I’m not always willing to purchase said products. And sometimes, honestly, I just don’t know about them. That is why, whenever I have the opportunity, I go to local, and sometimes not-so-local gluten-free expos and fairs. That’s how I was introduced to the GoMacro Macrobar. I was in Birmingham, doing the Making Tracks for Celiacs 5K with my mom. Immediately following the race, there was a gluten-free expo that participants and anyone who knew about it could attend. I was excited. Two years ago, I attended Birmingham’s first Making Tracks for Celiacs race and expo…and was blown away by the sheer scale and size. I walked out of there with two large grocery bags full of gluten-free freebies. This year, however, the size of the expo went down and the number of exhibitors definitely shrank. I felt a bit let down, actually. But there was still plenty to see and check out. And so…we began to make our way around the small banquet room and check out the local bakeries, local businesses, and some product exhibitors who did make it to the expo. Laying on one of the tables in the center were these GoMacro Macrobars. They looked interesting enough, touting on the wrapper that they were vegan, macrobiotic, and gluten-free. I snagged a couple and we moved on. Of course, they only had one of, what appears to be numerous, flavors out. 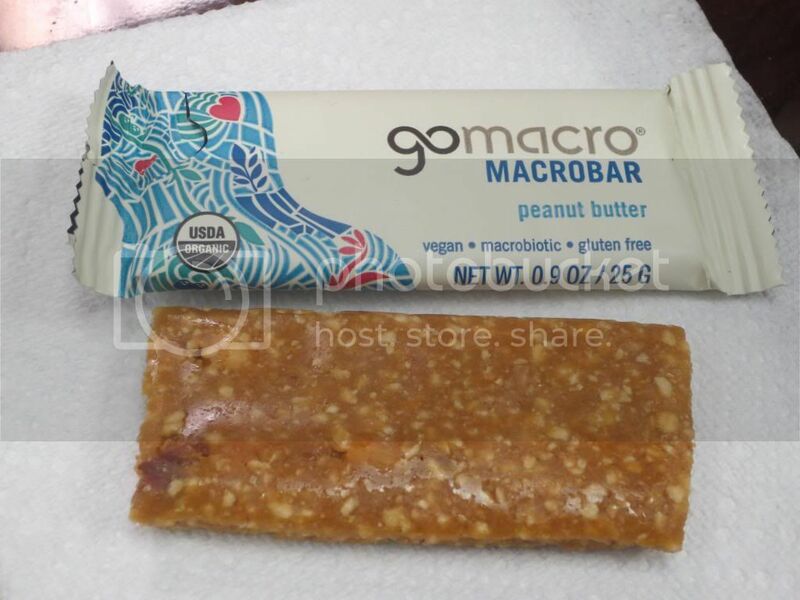 And so…that is how I got to try the GoMacro Peanut Butter Macrobar. I haven’t seen these around where I live. So…I was almost afraid to try them and fall in love with them. But, I needed a good afternoon snack for the office and these definitely would fit the bill. This week, I began taking the little sample bars with me to work, where I finally got to see what the GoMacro Macrobar was all about. 1. Veg Out – Vegan – Eat food. Not too much. Mostly plants. 2. Live Long – Macrobiotic – A macrobiotic diet is the key to a healthy life. 3. Be Well – Wholesome – If nature did not make it, we do not use it. 4. Community – Gives Back – Pay it forward. Give back. Change the world. 5. Tread Lightly – Sourced Sustainably – Let us walk softly on the Earth with all living beings great and small, remember as we go, that one God kind and wise created all. I do like the principles they put out there for their company and products. But how does the GoMacro Peanut Butter Macrobar stack up to other protein bars that I’ve tried. It’s…okay…really. It has the texture of a Lärabar…exactly. It even looks like a Lärabar. And it’s peanut butter. I love peanut butter. I have my own jar that I can just eat from whenever I want. The problem is limiting myself to a serving or less. It’s not easy. I’m a peanut butter addict. Sadly, however, this bar tastes very lightly of peanut butter. While I love the soft texture, the flavor just didn’t pop or wow me. It was good. Don’t get me wrong. I didn’t take a bite and spit it out…but there was just so little flavor to it, that I had to get a bite with a peanut actually in there to actually feel like I was eating something “peanut butter.” Now, this may be because GoMacro doesn’t add any salt or sugar…which I appreciate, but I sort of expected a little more pop, especially with the use of natural ingredients and the like. So, it was a small bit of a let down…but nothing that would stop me from eating these again, or trying other flavors should I be able to find them in my area. Ingredient-wise…it doesn’t get much easier than this. The GoMacro Peanut Butter Macrobar contains organic brown rice syrup, organic peanut butter, organic protein blend (brown rice protein and pea protein), organic puffed brown rice, and organic peanuts. Five ingredients. That’s it. And, as someone who is trying to eat more real food and cut out processed foods…this is a nice balance between the two. Eating clean…without having to make it myself. Nice! Nutritionally speaking, the mini-size of the GoMacro Peanut Butter Macrobar contains 100 calories and 3.5 grams of fat. That fat is derived from the peanuts and peanut butter that goes into these bars. Healthy fats. These bars are cholesterol and contain 0 grams of sodium. In addition, these bars only contain 5 grams of sugar. Love that. And you will also be consuming 1 gram of fiber and 5 grams of protein. Definitely a smart choice for a snack. So, while I wasn’t over-the-top in love with this bar, I would purchase it again. I like the commitment to fresh ingredients, simple ingredients, and just an overall appreciation of the environment and the body…and what gets put into it. I think these would be killer if they had a bit more flavor to them…but you do what you can without adding extra chemicals and sugar. And I’ll take a bland protein bar over one with an ungodly amount of sugar any day. If you find the GoMacro Macrobars…I encourage you to give them a shot. See what you think! This entry was posted in Clean Eating, Food, Gluten-Free, Nuts, Products, Review, Snack Bar, Snacks, Sweet Stuff, Vegan, Vegetarian by The Celiathlete. Bookmark the permalink.